"On dalr and holmr in the place-names of Britain"
Danish or Norwegian Origin ? Recent English studies of topographical place-name generics have suggested that the coiners of names were very conscious of the lexical content of the element and that they did not bestow lexically inappropriate names upon topographical features. The Anglo-Saxon settlers in England, for example, would seem to have used denu of a valley that was long compared to its width and had moderately steep sides, whereas valleys that were short compared to their width, sometimes bowl-shaped, sometimes trough-like, and frequently deep for their size, were referred to by the term cumb, a loanword borrowed from the native British (Cole 1982). On the other hand it is also true that some topographical generics are apparently used in English place-names with more than one lexical meaning, presumably because a development had taken place in the meaning of the generic after the coining of the oldest names. The English element leah, for example, would seem to have been used with such apparently contradictory meanings as "wood" and "clearing". The literary evidence for the word is sparse but its etymology and cognate words in other languages combine to suggest that the original meaning was treeless area and that as artificial clearing of wood-land progressed, a place-name in -leah, which originally denoted an open apace in woodland, would have been transferred to one of the remaining areas of isolated woodland so that the generic would come to have the meaning "wood" and a wood could receive a newly coined name in -leah (Stewart 1962). It has further been argued that leah later came to be used as a quasi-habitative generic (Gelling l974). In the light of these studies I have made an examination of two Scandinavian topographical generics which occur frequently in place-names in England, dalr and holmr, to see whether any development in their meanings can be shown to have taken place on English soil and whether or not, to employ the terminology of the triangle of reference (Ogden and Richards 1927, p. 11; cf. Alboge 1976, p. 140), they, too, could be used to coin names in which the referent was a locality of a quite different nature from the one indicated by the reference, the lexical meaning of the name. I have examined all the names containing these two generics which are recorded as being borne by nucleated settlements or settlement areas in sources from before c. 1500 from nine northern counties of England - Cumberland (CUL), Westmorland (WES), Lancashire (LAN), Cheshire (CHS), the three ridings of Yorkshire (YKSN, YKSW, YKSE), Lincolnshire (LIN), Derbyshire (DBY), Nottinghamshire (NTT) and Leicestershire (LEI), and from the county of Dumfriesshire (DFS), just across the border in Scotland. Both elements occur frequently in field- and other minor names, holmr being more common than dalr (see e.g. Cameron 1973, 1978), but such names have not been taken into consideration in the present survey. This is because where they are recorded in early sources, it is rarely possible to locate them closely enough for a determination of their denotata to be feasible. DALR, s, m., old plural, dalar, acc. dala … [Anglo Saxon dæl; English 'dale' …] a dale; alliterative phrase, djúpir dalir, deep dales … the word is much used in local names, Fagri-dalr, Fair-dale; Breið-dalr, Broad-dale; Djúpi-dalr, Deep-dale; Þver-dalr, Cross-dale; Langi-dalr, Lang-dale; Jökul-dalr, Glacier-dale, (compare Langdale, Borrodale. Wensleydale, etc. 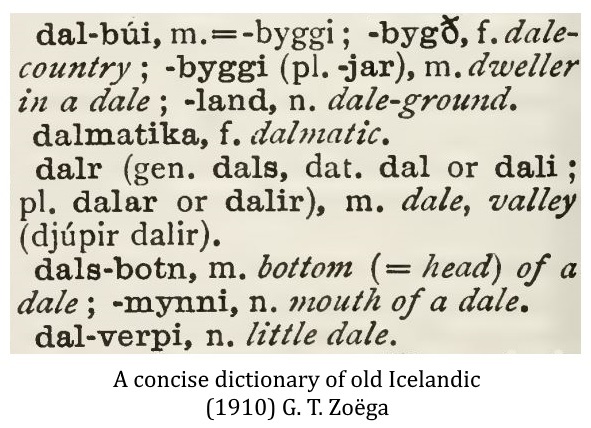 in Northern English); 'Dale' is a frequent name of dale counties, Breiðatjarðar-dalir, or Dalir simply, Landnámabók: Icelandic speak of Dala-menn, 'Dales-men' (as in Engl. lake district); dala-fífl, a dale-fool, one brought up in a mean or despised dale … the parts of a dale are distinguished, dals-botn, the bottom of a dale … dals-öxl, the shoulder of a dale; dals-brún, the brow, edge of a dale; dals-hlíðar, the sides, slopes of a dale; dala-drög, the head of a dale; dals-mynni, the mouth of a dale; dals-barmr, the 'dale-rim', = dals-brún; dals-eyrar, the gravel beds spread by a stream over a dale, etc. : -in poetry, snakes are called dale-fishes, dal-reyðr, dal-fiskr, dal-ginna, etc. … [It is interesting to notice that patronymic words derived from 'dale' are not formed with an e (vowel change of a), but an œ, æ (vowel change of ó), Lax-dœlir, Vatns-dœlir, Hauk-dœlir, Hit-dœlir, Sýr-dœll, Svarf-dœlir … the men from Lax(ár)dalr, Vatnsdal, Haukadal, Hitardal, etc. ; compare the mod. Norse Dölen = man from a dale; this points to an obsolete root word analogous to ala, ól, bati, bót; vide the glossaries of names to the Sagas, especially that to the Landnámabók. The generic dalr is of frequent occurrence in place-names in Scandinavia, where in hilly and mountainous areas it generally refers to a longish valley running between hill or mountain ranges. In Denmark the valleys referred to are sometimes less clearly defined. There is a related Old English word dæl but this is only recorded independently with meanings such as "pit" or "hollow" and there are good reasons for believing that the English word can be discounted as the origin of the place-names in -dal in England (Fellows Jensen 1982, pp. 25-28). It must not be forgotten, however, that the Scandinavian word was adopted into the northern dialects of Middle English so that names in -dal which are not recorded in early sources may simply be English formations containing a Scandinavian loanword. In the English and Scottish counties listed above I have found 202 names in -dalr recorded in early sources. Outside the areas of Scandinavian settlement the normal term employed in place-names for a longish, narrowish valley is denu, a generic which is also of common occurrence in Cheshire, southeastern Lancashire and the East and West Ridings of Yorkshire, and which occurs sporadically in the other northern counties. There is some written evidence both for the replacement of an original denu by dalr, as in Bakestonedale (CHS) (Blakestonisdene  17, PN CHS 1. 131), Langdales WES (Lang(e)den(e) 1179; PN WES 1. 203), and in several names in the West Riding of Yorkshire (PN YKSW 2.182; 5.100, 104; 6.31, 36, 99), and for the pexegetic addition of dalr to a name in -denu, as in Oxendale LAN (Oxedene c.1200; PN LAN 70) and Longdendale DBY (Langedenedele 1086; PN DBY 69), and it is possible that many of the names in -dalr are scandinavianisations of earlier names in -denu. Table 1 shows the distribution of the names in -dalr between the various kinds of valley denoted. Of the 202 names examined, 166 now refer either to part or whole of clearly defined river valleys or to a settlement or settlements within such a valley. The sites of 26 of the places lie in less well marked valleys, often close to the shore of sea or lake, while the sites of the remaining 10 places are either lost or buried under urban sprawl. There is no trace in England of the use of dalr as a stereotype, romanticised generic in the names of country houses. Where the referent of a name is a river valley, this generally includes the valley in more or less its full extent, together with the enclosing ranges of hills or higher land. Sometimes the valleys are those of major rivers and the referents of the names, whose specifics are generally the name of the river concerned, are large administrative divisions or settlement areas, such as the sheriffdom of Annandale in Dumfriesshire, the Wards of Allerdale and Eskdale in Cumberland and of Lonsdale in Westmorland and Lancashire, and the dales of the North and West Ridings of Yorkshire such as Teesdale, Swaledale, Airedale and Wensleydale. More frequently the referents of the names are the valleys of smaller watercourses. The specifics of these names are only very occasionally the name of the river or stream running in the valley, as in Borrowdale We (*borg(ar)-á), Fangdale YKSN (*fang-á). As a general rule the streams in question take their names from the valley, for example Mossdale Beck and Grizedale Brook. Of the names in -dalr whose referents are less clearly defined valleys, five are found in the comparatively low-lying West Derby Hundred in Lancashire, three in or near the Wirral in Cheshire, and several of the others close to the lakes in Cumberland and Westmorland. It seems that in Britain, as in Scandinavia, the sense in which dalr was used reflects the topographical nature of the area concerned. Since the same variation is found in the Scandinavian homelands, there is no need to reckon with sense development on English soil. A modification of the meaning of -dalr may perhaps be seen, however, in the names whose referent is a section of a valley. Quite frequently the name consists of a settlement name plus -dalr. The referent of Malhamdale YKSN is thus the upper reaches of the Aire valley around Malham and that of Bradford Dale YW the part of the valley of Clayton Beck in which Bradford stands. Particularly interesting is the name Scarsdale in Derbyshire, whose specific is either the Scandinavian personal name Skarfr or the bird-name skarfr "cormorant" that lies behind the personal name. It has been suggested that the original referent of the name Scarsdale was a section of the Amber valley (Anderson 1934, 1. pp. 33-34) but in that case by 1086 at the latest there had been a change of referent and the name had come to denote an extensive administrative hundred. There are a few instances of names in -dalr whose present referents are settlements in major valleys, for example Hawksdale and Cummersdale in the valley of the Caldew in Cumberland, while there are more numerous instances of names in -dalr whose present referents are nucleated settlements in minor valleys. These latter names occur particularly frequently in Cumberland and the North Riding of Yorkshire. It seems more likely that the original referents of the names were the valleys and that a change of referent has taken place than that the names were originally coined for the settlements at a time when dalr had acquired a quasi-habitative meaning. There is no way of determining this with certainty but that the original referents of the vast majority of the names in -dalr were valleys rather than settlements is suggested by the fact that comparatively few of them are recorded in Domesday Book of 1086 as being borne by settlements. In Yorkshire and the East Midland counties for which the Domesday Book record is reasonably comprehensive, only 18 of the names in -dalr, or 16%, are borne by settlements named as such in this source. Of the 202 names from the whole area examined, only 55, or 27%, are borne by parishes or townships at the present time. In summary, then, it would seen that the names in -dalr in northern and eastern England were given to the kind of feature for which the English generic denu is employed in southern England and it is possible that many of the northern names in -dalr in northern Eng1and were given to the kind of feature for which the English generic denu is employed in southern England and it is possible that many of the northern names in -dalr have replaced names in -denu. Originally referring to the whole of a valley with its enclosing hill-ranges, the generic would later seem also to have been used in a more limited sense of a section of a valley. It is possible but not demonstrable that the Scandinavians also coined primary habitative names in -dalr whose referents were settlements established in valleys. The only names for which there is early evidence of a change or expansion of meaning of the generic after the coining of the name are the names of administrative divisions. Whereas the Wards of Allerdale and Eskdale in Cumberland, the Wards of Kendale and Lonsdale in Westmorlamd, the Hundred of Lonsdale in Lancashire and the Wapentake of Ryedale in the North Riding of Yorkshire are at least roughly coterminous with the major river valleys (including surrounding areas) from which they take their names, there is no such obvious link between the name Scarsdale in Derbyshire and the geographical area of the hundred that is the present referent of the name. It may well be that the fact that names in -dalr frequently denoted quite extensive areas paved the way for the formation of administrative names in -dalr, even when, as in the case of Scarsdale, the valley in question was a comparatively insignificant one that can in no way be said to be the dominant topographical feature of the hundred. Elements denoting valleys are of rare occurrence in the names of the hundredal units in southern England (Anderson 1939, 3. pp. 173-74, 189). The few hundred-names in -denu are all secondary names, taken over from the hundred meeting-places. In northern England and south-western Scotland, however, names of administrative divisions in -dalr are common. The earliest recorded forms (from 1124) of the names of Nithsdale and Annandale in Dumfriesshire are Stranit and Estrahanent respectively, suggesting not only that the names were originally purely British formations in Strath- "valley" but also that these divisions and the divisions in northern England with names in -dalr represent early Celtic territorial units (Barrow 1975). It is possible that the Scandinavian settlers, having taken over these administrative divisions and scandinavianised their names to ones in -dalr, would then have found it quite natural to coin a primary hundred-name in -dalr. The generic holmr, together with a side-form holmi, is of frequent occurrence in Scandinavia. Etymologically the element is related to Latin culmen "peak" but it occurs in Scandinavia both independently and in place-names with two main senses: 1) "a (small) island", 2) "raised land, often surrounded by watercourses, ditches, marshland or the like". The related English word holm is only recorded in the senses "sea, ocean, wave" (OED) and it seems certain that the element holmr in place-names in England and Scotland is of Scandinavian origin. The word survives in English in the form holme and is now used (1) of the small grassy islands of the Northern Isles and (as a foreign word) of islands in Scandinavia, and (2) in Scotland and the north of England of "a piece of flat low-lying ground by a river or stream, sub-merged or surrounded in time of flood". Names first recorded in comparatively young sources may well not have been coined until after the word had been adopted as a loanword in English. In the English and Scottish counties listed above I have found 176 names in -holmr recorded in sources from before circa 1500. Outside the areas in which there was Scandinavian settlement, the generic is only of sporadic occurrence. Table 2 shows the topographical features which are denoted by the generic in the individual counties. It has not always been easy to classify the names, for the category "Island of higher dry ground in a marshy area" embraces sites which in the winter at least could equally well be described as "piece of land almost surrounded by water", and the latter description could also apply to some of the names which have been placed in the category "water-meadow". There are no instances in Britain of the use of holmr in place-names to denote an artificial island on which a castle or manor-house had been built or of the resulting use of holmr as a stereotype generic in the names of such establishments. The present referents of most of the names in -holmr are settlements on sites which can be described by the term holmr in one of its recorded senses. There is no way of determining with certainty whether or not any of these names are primary settlement names in which the reference and the referent have been in disagreement from the very moment of naming. Since only 30 of the 176 names examined, or 17%, are borne by parishes or townships at the present time, however, and only 22 out of the 98 names in Yorkshire and the East Midlands are recorded as settlements in Domesday Book, it seems likely that the majority of the names in -holmr began life as names of topographical features. The most striking feature about the distribution of the place-names between the various categories is the rarity of instances in which the referent of the name is an island proper. There are, in fact, only two isles in Cumberland, Derwent Isle (Hestholm 12; PN CUL 302) and St Herbert's Island Herbertholm 1343; PN CUL 371), although the rocky peninsula of Dunnerholme in Lancashire has been treated as an island for the purposes of classification, since it is quite cut off from the mainland by marsh and alluvium. It is most common in England for the referent of a place-name in -holmr to be a piece of land that is almost surrounded by water and this sense of -holmr is the dominant one in Yorkshire place-names. Names whose referents are areas of "higher dry ground in a marshy area" are of particularly frequent occurrence in Lancashire, especially in Amounderness Hundred. This fact must reflect the marshy mature of much of lowland Lancashire. The same explanation would account for the occurrence of holmr in this sense in names in Holderness and other low-lying areas of the East Riding of Yorkshire. Whereas the senses "island", "land almost surrounded by water" and "plot of higher, dry ground in a marshy area" are all well evidenced in place-names in the Scandinavian homelands, it is possible that the occurrence of place-names in -holmr whose referents are a "water-meadow" or a "strip of land along a stream" is typical of the Scandinavian settlements in Britain. Some of the sites classified as "water-meadow" could, as mentioned above, be classified as "plot of land almost surrounded by water" but there remain sufficient names in which holmr would definitely seen to denote a "water-meadow" for it to be worthwhile to seek an explanation for this extension of meaning in the generic. There is a much discussed Old English generic hamm which, although unrelated to the Scandinavian word holmr, occurs in many place-names in southern England whose referents are similar in nature to those of the place-names in -holmr in the north. The first detailed study of place-names containing the element hamm was made by Margaret Gelling, who argued that hamm was used in place-names with the following senses: (1) "land in a river-bend", (2) "promontory", (3) "river-meadow", (4) "dry ground in a marsh", (5) "cultivated plot in marginal land" (Gelling 1960). Her classification was later refined by John Dodgson, who divided category (5) into (5a) "cultivated plot in marginal land" and (5b) "an enclosed plot, a close", and added a category (6) "a piece of valley-bottom land hemmed in by higher ground" (Dodgson 1973). While Gelling had argued that "land in the bend of a river" was the original meaning of hamm, Dodgson looked upon the whole set of meanings as figurative expressions of the basic concept of "a surrounded, hemmed-in place" and Karl Inge Sandred's subsequent thorough study of the etymology of the element suggested to him that the original meaning was "enclosure" and that the meaning "plot of ground by a river" developed from this because river-meadows were frequently enclosed to protect them from straying cattle Sandred 1976). Arguing that the use of hamm in English place-names is quite different from that of generics such as woro, which certainly originally referred to man-made enclosures, Gelling has more recently produced a still tentative translation of hamm as "place hemmed in by some feature of the topography, often by water or marsh" (Gelling 1978, pp. 114-15). Margaret Gelling noted in 1960 that the Scandinavian generic holmr shared some meanings with hamm and that both elements survive in modern usage in England with a sense "water-meadow" which is considered to be a secondary one. She also noted that the generic hamm had a limited geographical distribution, being apparently confined to the southern counties of England, Gelling has later acknowledged, however, that hamm certainly occurs as far north as Shrewsbury and probably also in Cheshire and Yorkshire (Gelling 1974). A comparison of the distribution of names in -hamm with that of names in -holmr in the whole of England shows a remarkable degree of separation and the question arises as to whether the Scandinavian generic in some of the northern place-names may not have replaced the English one. There is certainly evidence from the post-medieval period of the replacement by holmr of an earlier -ham, which could represent either hamm or ham, as in Barholme (Berc(a)ham 1086, Barhome 1494, Barholme 1529; Fellows Jensen 1978) and Dunholme (Duneham 1086, Downholne 1537: Cameron 1973) in Lincolnshire. The superficial similarity in sound, combined with the fact that holmr and hamm had a number of meanings in common, can have encouraged the replacement of the latter element by the former in the areas of dense Scandinavian settlement. The question which poses itself at this point is whether it is the common use of the element hamm to denote a water-meadow that led to the acquisition of this meaning by the unrelated holmr. It is true that there is some evidence for the use of holmr to denote meadowland beside water-courses in Denmark, where holmr occurs particularly frequently in minor names in South Jutland. Here it is used of small plots of meadowland (DS 3. xxxiv), the situation of some of which, for example Alum and Skilum in Bjolderup (DS 6. 333, 335), suggests a sense "water-meadow". There is no evidence for the development of this sense in major names in Denmark as early as the Viking period, however, and it would not seem unreasonable to consider that the development of the sense "water-meadow" for the generic holmr took place in Britain independently of any such development in Scandinavia. Place-names in -holmr whose referents are water-meadows are of particularly frequent occurrence in the West Riding of Yorkshire and Dumfriesshire. It is perhaps significant that Yorkshire is one of the counties where Margaret Gelling suspected the presence of hamm in major names. Bentham (PN YKSW 6. 232} and Clapham (PN YKSW 6. 232), for example, stand beside the River Wenning and Clapham has a recorded spelling in -hamme 1202-08, while Hubberholme (PN YKSW 6. 116) stands beside the River Wharfe and the -ham of its early forms had been replaced by -holmr before 1686. It is also interesting to note that modern forms in -holm occur for place-names with early spellings in -ham in southern Scotland, Smallholm DFS, Smailholm and Yetholm in Roxburghshire and Leitholm in Berwickshire (Nicolaisen 1976, p. 76). This suggests that these Border place-names may originally have contained hamm rather than, as hitherto assumed, ham. Linguistically there is no way of determining which was the original generic of the names but it might be noted that the sites of all the four above-named settlements fall within the categories established for places with names in -hamm and/or -holmr. Smallholm stands on land almost surrounded by water that could be described as a promontory; Smailholm stands on raised ground; while Yetholm and Leitholm are on low-lying ground beside water-courses. That the generic holmr might have developed the sense "water-meadow" in England independently of the influence of hamm is a possibility that must not be left out of consideration. The development may simply have taken place because the Scandinavians felt the need for a term to denote the water-meadows they came across in the new country. It is perhaps of relevance to note that the English generic halh, which usually denotes a "nook or corner of land", also developed the sense "water-meadow" and that this is the sense which survives in modern English dialect haugh. Table 3 shows the distribution of north-western place-names in -halh between the senses "nook" and "water-meadow". It will be noted that the generic is of common occurrence in Lancashire and Cheshire but that it is only in Lancashire that it occurs frequently in the sense "water-meadow". Seven of the 14 instances in Lancashire are found in the south-eastern hundred of Salford. Comparison with Table 2 suggests that the reason for the comparatively rare occurrence of holmr in the sense "water-meadow" in Lancashire may have been that the Scandinavians simply adopted the existing English names for these meadows. There are seven names in the north-west in which halh is compounded with a Scandinavian specific but only two of these are in Lancashire. In conclusion it would seem that place-names in -dalr and -holmr were only given to localities to which the generics were lexically appropriate. For dalr there is no certain evidence in place-names in Britain for a change of meaning, although the hundred-name Scarsdale may just possibly be an instance of the use of dalr in a primary name for an administrative division. For holmr there is good evidence for the development in Britain of a meaning "water-meadow, strip of land beside a stream" and this sense-development may have been influenced by the fact that an unrelated English generic hamm, which shared meanings with holmr and which may have been replaced by the latter element in a number of place-names in the northern counties, also developed the secondary meaning "water-meadow". As shown by the use of holmr to denote a "plot of meadowland near a water-course" in South Jutland and by the development of the sense "water-meadow" for another English element, halh; however, it is possible that the development of the secondary meaning of holmr took place quite independently of the influence of hamm. Both dalr and holmr occur frequently in England as generics in settlement names but there is no way of proving whether or not these names were coined as primary settlement names in which there was disagreement between the referent and the reference at the very moment of naming.